Nevercenter's CameraBag 2.5 is like having dozens of films and cameras from different eras sitting on the desk to choose at will. Versatile and historical, this Mac image editing and filtering desktop app offers an overwhelming number of options for both fixing and stylizing the look of your photos. Any single or combination of settings will have a profound effect on your image, and the app's flexibility lets you experiment endlessly and nondestructively with a few clicks. Film photographers were famous for using only a fraction of the shots they took. And while that may also be true today, digital photography has facilitated the capture of an astronomical number of frames, free for the price of your memory card and storage space. With the explosive popularity of effects filters (thanks to Instagram), ordinary shots gain more potential for interest and uniqueness. High quality filters like those in CameraBag 2.5 can enhance great shots and perhaps even salvage those which otherwise might have met their delete key demise. Style previews automatically appear as you mouse down the filter list. Users of the previous CameraBag 2 will encounter a number of interface tweaks and new features in this version. Version 2.5 has removed the Favorites tab and renamed the Styles tab to My Styles. A new ability to nest tiles—each of which represent the components of a style, and which can be adjusted individually—lets you easily combine effects for simultaneous editing and tweaking. It also assists in batch processing. A new watermark feature, which you can save as a custom style, lets you sign your work. 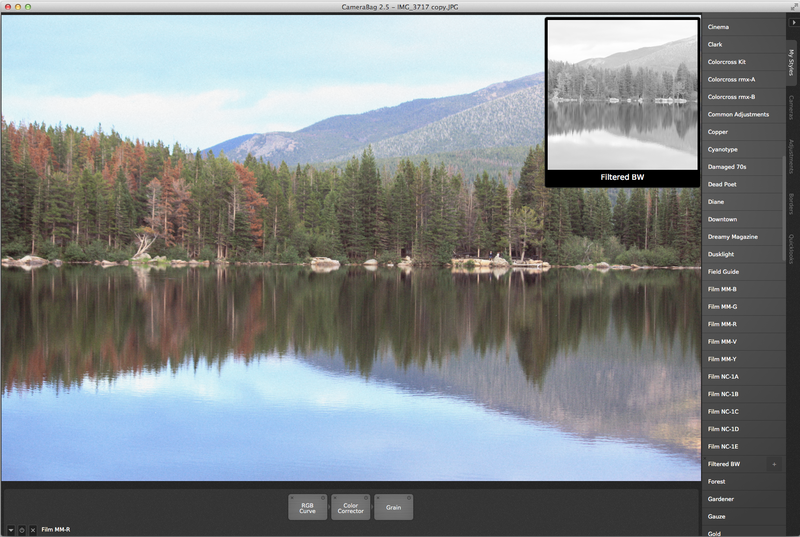 Developers have added sharpen, blur, circular blur options, and more to the new version, giving the program even more basic photo editing prowess. 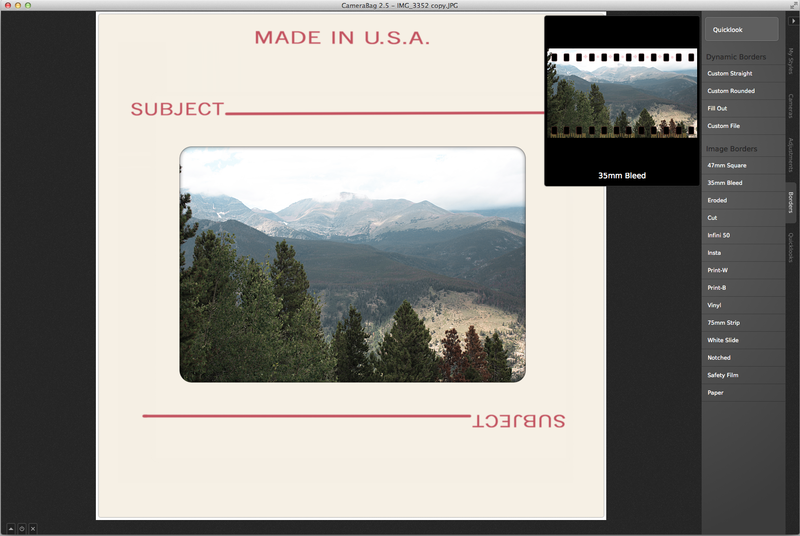 You can now import custom image borders to apply from within the program. Any filter you create on your desktop can also be used with CameraBag's iOS apps for the iPhone and iPad. 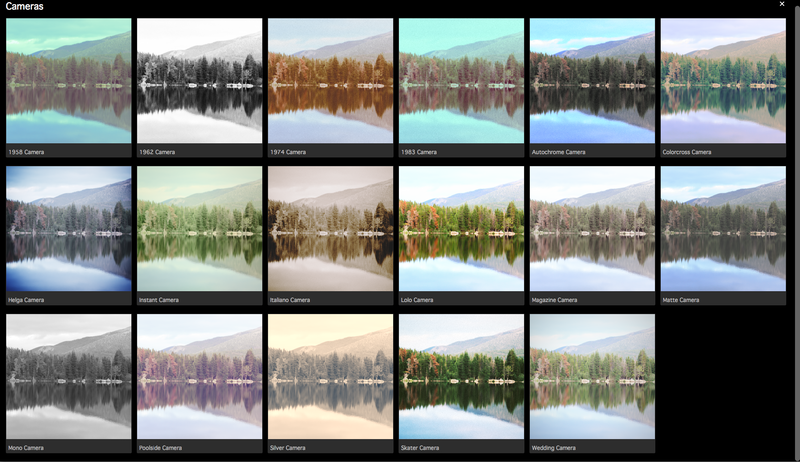 Newcomers to the app will likely start from the top with the My Styles tab, which contains more than 150 preset image filters whose titles may or may not offer some clue as to their look. Names like 1967, Blueburn, Dusklight, Leaky Helga, and Stained Italiano may require some deciphering, but you can quickly cycle through each generously sized preview as you move your mouse down the list, as performance of this app is fluid and swift. 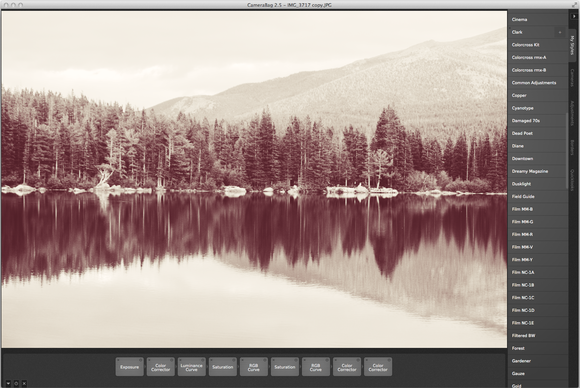 The Quicklook button at the top of the menu bar opens up a breathtaking full screen rendition of each filter, camera, edit, or frame as it would look individually applied to your photo. There's even a Quicklooks tab that puts them all together. The Quicklook function is one of the most useful features of this app, as it lets you view at a glance what each control will look like on your image. You don't have to take each filter as it comes. Within each style, a tray holding the style's component tiles, and on-screen sliders that control them, let you adjust the image to your liking. While styles function as a building block for effects, they can easily stand on their own without any tweaking at all, but it's likely you'll want to experiment with styles to bring out the best in your photo. An elegant tabbed interface lets you choose cameras, filters, adjustments, and frames and preview their effects. You are not limited to a single style, either. As you mouse down the style list, you can use the plus (+) button that appears on a selection to add that style's tiles to the tray. Each tile can be adjusted individually—a tiny button lets you toggle its preview—and tiles that add an effect you don't want can be individually removed. When you have a combination you like, save it as a new style that is added to the full list. It can be used on other images and shared. Experiment with style tiles in the bottom tray by moving their position, toggling them on and off, or deleting them at will. Save a favorite combination as a new style. In addition to film-like filter presets and 17 new historical cameras, the program also facilitates a classic image editing workflow. The Adjustments tab offers familiar crop and straighten tools, contrast, and saturation, however, other adjustment categories like Light, Color, Photographic, and Utility, offer more opportunities to apply basic edits. These adjustments operate interactively with smooth performance and real-time preview. You can input a variety of standard formats, plus Raw and PSD, and output to JPEG, TIFF, or PNG at the dimension and quality of your choice. 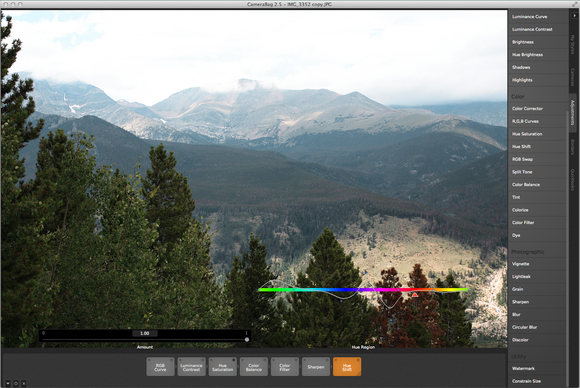 A set of editing tools lets you adjust your images in a classic workflow, but offers distinctive and unique techniques. Although I found CameraBag 2.5 easy to use without having to consult the documentation, there are extensive image editing choices, and some controls and sliders aren't initially familiar or intuitive. It's worthwhile to have a look at the documentation. Unfortunately, most of Nevercenter's instructional videos aren't yet current with the new version. Users pf previous versions might miss the Favorites tab. Since there are so many styles, it might have been easier to simply group favorites together in one place along with new styles you create. Right now, I have to search for my own custom style among the many other built-in presets. There's no way to paint effects on to a discrete part of the image—application of a filter or edit is an all or nothing affair. And, it would be nice if there were a tabbed interface that let you work with more than one image at a time. Choose from a collection of interesting borders or create and use your own. CameraBag 2.5 is a great app for photographers who want to add some quick filters and unique looks to their photos without a lot of fuss—but if you want to experiment, you can easily knock yourself out. The ability to combine and tweak styles, controls, borders, and edits is tested only by your patience and desire to make the photo look the way you want it to. A sharing component lets you share and download favorite styles from other users, and transfer styles to your mobile device. The fact that you can start your workflow with basic adjustments and end it with a frame and watermark gives the program even more value. If you now have version 2, upgrade to version 2.5 now. It's free. If you're still using version 1, paying $20 for the new version is well worth it. With filters and camera styles ranging from vintage to modern, CameraBag 2.5 lets you transform the look of any photo.